[You must be registered and logged in to see this link.] wrote: <3 B&Hammered! 4chan is a bunch of bs and crap. 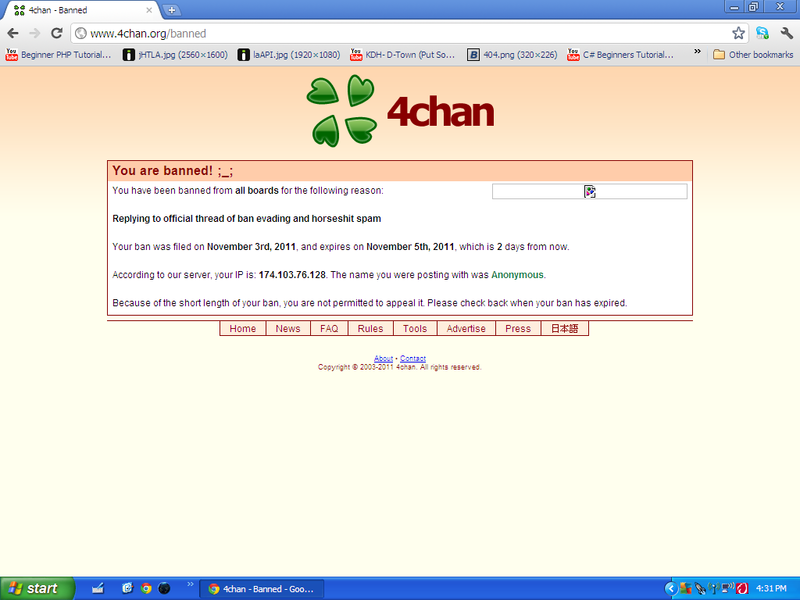 Ninja wrote: 4chan is a bunch of bs and crap. To my surprise, some boards are actually alright. /b/ is obviously awful though. /swf/ I thought it would be flash...I was slightly right.. .__. Also, why does 4chan care what you do when basically everyone there is a troll? Excellent, i just go there to view their boards i don't have an account. Ninja wrote: Also, why does 4chan care what you do when basically everyone there is a troll? I don't know beeer, why don't you tell us. Why do people go to sites filled with people that hate them just to get trolled? Ninja wrote: Excellent, i just go there to view their boards i don't have an account. God you are such a moron. Hard to tell if you are serious or not. They don't care. The rules clearly state "ZOMG NONE!! !1" for mods and users. So the users and post whatever they feel like and the mods and ban for whatever reason.